Q: What are the benefits that People’s Credit Card holders are to receive during the festive season of the Sinhala and Hindu New Year? A: We have made arrangements to offer People’s Credit Card holders discounts up to 50% at high-end hotels and holiday resorts, top clothing stores, restaurants, supermarkets, outlets for shoes, leather products and a wide range of services such as optical care, interior decoration, travel, health and insurance as well as for all internet purchases. We have also made arrangements for them to obtain these services on easy payment terms spread over a period of 12 months without having to pay any interest. Further there would be other special services through the Card Centre of the bank. In fact People’s Credit Card holders can reap many other special benefits not just during the festive season but throughout the year. We are pleased to inform all our customers that thanks to the unprecedented technological revolution that has taken place in our Card Centre we can now offer more facilities and conveniences to all our credit and debit card holders. In particular, during the festive season, the bank is planning to expand its services by launching a Premier Card in addition to the existing Classic and Gold of the People’s Master and Visa card range. People’s Card holders will also be able to access the full services made available through the prestigious Loyalty Point Scheme. Q: What’s so special about this 50% discount for People’s Credit Card holders? A: People’s Credit Card holders will be able to benefit from the concessional interest rate as well as easy payment through instalments and many other benefits. Q: Could you elaborate on how payments should be made on goods for which discounts are on offer? A: People’s Bank Visa Credit Card, by offering the lowest interest rate and the easiest payment scheme, makes for an even more hassle-free lifestyle for our card holders. While the card accords them high levels of security and ease, they can make their payment at any of the 735 branches located across the island or through mobile or internet banking. Q: How can one obtain further information on all this? A: You can call our hotline, 1961, and get all the information you need. I would like to make special mention of the fact that those who obtain a People’s Master Credit Card before the 15th of August would be exempted from initial connection fee and the annual fee for the first year. 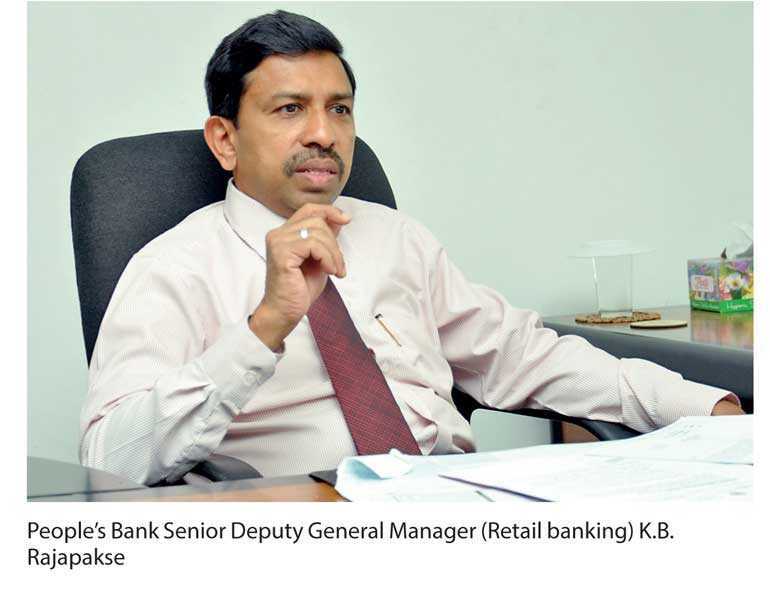 People’s bank has stepped into a new era by introducing modern technology to the Sri Lankan banking sector to face the radically changing competitive global environment. We are ready to delight you and cordially invite you to experience the special privileges coupled with the outstanding service of People’s bank. If you do not have a People’s Credit Card yet, we invite you to visit the People’s Bank branch closest to you and reap the many benefits that are on offer during this Avurudu season.